Chapman University Fowler School of Law boasts an impressive array of student organizations that offer the best combination of camaraderie and legal exploration. Learn more below. The purpose of the Chapman Air and Space Law Society (CASLS) is to provide support and networking opportunities for students seeking involvement in the fields of law regulating and litigating the aeronautic and space industries. CASLS also aims to serve as a liaison between the law student body and air and space law attorneys, academics and other professionals in the community; and to promote and encourage the law student body's involvement in, and knowledge of, the increasingly important fields of space and aeronautic regulation and litigation. Chapman’s Appellate Moot Court Competition Board offers selected students the opportunity to develop oral and written advocacy skills learned in the classroom by applying them in simulated arguments before the Supreme Court. The Southern California area has traditionally had a large, very diverse Asian-American population. One of the most important, but most difficult, aspects of such a large, diverse population is representing the very interests of those individuals who comprise this community. In the midst of this community lies Fowler School of Law. The progress that law school has made towards becoming a formidable legal institution has been furthered by brilliant legal scholars, as well as socially conscious and aware advocates. The inception of the Asian-Pacific American Law Students Association (APALSA) at the school of law in 2002 marked a pivotal time in the school's history because it recognized the very need for an institution and an organization that is ready and willing to address the needs of this very Asian American community, and the surrounding community at large. As a support group, APALSA provides a strong backbone for new students starting their long journey towards a legal career, while constantly pushing and encouraging continuing students to stay on the right path. APALSA also serves a networking function, bridging the gap between the Asian-American legal community and law students preparing to enter that community in the future. As an academic group, APALSA provides entering students with tips and strategies for facing the challenging situations that students will most definitely encounter in their first year. The strides that APALSA has made since its inception will continue to be its earmark in the future as the school of law continues its path towards supremacy as a legal institution. The years ahead for APALSA are extremely bright, and as an organization, it can only progress further as its members continue to maintain and excel in and out of the classroom. As an organization aimed to empower students and increase cultural diversity, the Black Law Students Association (BLSA) strives to engage Chapman University Fowler School of Law students in the necessary dialogue to effect positive change and provide a support system for Black students. BLSA is not exclusive to those of African heritage, but is all encompassing as it acknowledges both the beauty of diversity and the unique needs of the African American community. BLSA serves to effectively provide a safe space for minority students and focus on how to actively participate in voicing a unique perspective, advocating for equal rights and opportunities, and bridging the gap between minorities and legal professions. Charted at the law school in 2016, when the entering class consisted of three Black students, BLSA strives to collaborate with the admissions office to increase the representation of Black students at Chapman University Fowler School of Law. Through community engagement and outreach to prospective Black students, BLSA is committed to Chapman University Fowler School of Law’s mission to promote and increase diversity at Fowler. To get up-to-date information on Chapman Women Lawyers Association meetings and events, please sign up for the Chapman Women Lawyers Association TWEN page through Westlaw. Ms. JD: Serving women in law school and the legal profession, Ms. JD is an online community that provides a forum for dialogue and networking among women lawyers and aspiring lawyers. League of Women Voters: Nonpartisan political organization that encourages informed and active participation in government, works to increase understanding of major public policy issues, and influences public policy through education and advocacy. National Organization of Women: Press releases and other information about N.O.W. concerns and links to other sites. The purpose of the Children and Family Law Society is to educate students on pertinent aspects of family law and to attract speakers who will teach them about not only family law issues, but also about how to cultivate a career in the legal discipline. The purpose of the Criminal Law Society at the Chapman University Fowler School of Law is to promote and encourage the study of criminal law and to develop a strong relationship with the criminal law bar. The Society aspires to the highest standards of personal integrity, diligence, and individual responsibility in the study, teaching, and practice of criminal law and the criminal justice system. The Diversity and Social Justice Forum is a student-run scholarly publication at Chapman University Dale E. Fowler School of Law, dedicated to providing a forum that can give expression and representation to a wide spectrum of progressive and diverse voices at Chapman. We believe that the key to fostering a strong and diverse student body is to ensure that we do not confine ourselves to an echo chamber, and that we are not dismissive of alternate viewpoints and methods. The Diversity and Social Justice Forum hopes to promote a climate of engagement and dialogue with a wide spectrum of views and values. To this end, the Diversity and Social Justice Forum hosts an annual symposium on issues of social justice, and publishes the DSJ Forum, an online publication featuring practice-oriented issues of social justice, including any aspect of the underlying legal or humanitarian concerns, legal or policy solutions, or the work of movements organizing to address the problem. The field of sports and entertainment law incorporates an extraordinarily broad and varied practice area. The practice covers substantive areas of law such as intellectual property, contract law, labor law, anti-trust law, and corporate finance. It also requires an understanding of a client's experience within the world of athletics and/or entertainment. It is for this reason that the Entertainment and Sports Law Society endeavors to educate its members on the relevant legal issues that accompany this rigorous practice area. By organizing on-campus lectures, conference and convention field trips, and social gatherings, the society seeks to work with individuals and organizations within the profession and provide information and assistance concerning potential employment opportunities. Health Law Society (HLS) is a practice-oriented student organization devoted to educating and bringing awareness to the important and evolving field of health law. HLS offers a forum where students, staff, & legal professionals can discuss emerging legal issues in the healthcare industry. In addition, because health law is an interdisciplinary field, HLS collaborates with other student organizations to educate about the cross-over between health and other areas of law. HLS also serves as a liaison between students interested in health law and professionals practicing in the field, and will provide networking opportunities for students. Membership in HLS is open to all in the Fowler School of Law community who wish to learn about health law, hear from health lawyers and practitioners in the field, and explore internship and career opportunities. providing opportunities for student involvement and career exploration via exposure to immigration lawyers and areas of legal practice that intersect with immigration law. The Immigration Law Society warmly welcomes all interested students to its events! Intellectual Property Law Society is a student organization aimed at educating law students about the field of intellectual property law. While this field of law mainly comprises patents, copyrights, and trademarks, issues related to its practice are encompassed by many other types of law, including business and entertainment law. IPLS offers a forum for discussion about current issues in intellectual property and opportunities for networking with professionals in the field. IPLS hosts at least one event per semester, which usually includes a relevant speaker or panel. Membership is open to all Fowler School of Law students and faculty who have an interest in intellectual property law. The purpose of the International Law Society (ILS) is to promote informed awareness of diverse issues which relate to international law and global affairs. The organization assists students in developing their interest in international law as a career and area of legal specialization with focus on International Business and Humanitarian opportunities. The ILS helps bring together students and community members of diverse cultural backgrounds. The ILS regularly hosts events through its speakers program, presenting diverse lectures and discussions by internationally-minded experts. These promote interest in international studies, as well as foster interaction among members of the law school community. The J. Reuben Clark Society affirms the strength brought to the law by a lawyer's personal religious conviction, and strives through public service and professional excellence to promote fairness and virtue founded upon the rule of law. The Fowler School of Law J. Reuben Clark Society is a student group that emphasizes the relation between law and ethics, morality and religion. The Korean American Law Students Association (KALSA) aims to promote Korean culture and awareness while providing all members a platform for academic support, professional outreach, and social networking. KALSA seeks to foster attorneys who are successful and prepared to deal with diversity issues on a global scale. Lawyering for reproductive justice is a concept and practice that If/When/How is committed to developing in meaningful partnership with those most affected—including groups that focus on criminal justice reform, the school-to-prison-pipeline, LGBTQ rights and other issues that are integral to achieving reproductive justice. The tension between privilege, oppression, the traditional legal framework, and the radical framework of reproductive justice is ever-present. In light of this, we are constantly asking questions, learning more, and leading the evolving conversation about what it means to be lawyering for reproductive justice. Reproductive justice will exist when all people can exercise the rights and access the resources they need to thrive and to decide if, when, and how to create and sustain their families with dignity, free from discrimination, coercion, or violence. Minority Law Students Association (MLSA) exists to address the unique needs and concerns of minority law students, and to promote diversity within the Fowler School of Law community and legal profession in general. Specifically, MLSA seeks to develop, implement, and maintain programs to increase the recruitment, academic excellence and professional development of students of color at the school of law. MLSA also exists to provide a social support group for minority students in fostering their success and happiness. Activities include various outreach programs to high school students, social functions, speakers, panel discussions and scholarship opportunities for current law students. Membership is open to all students. Through the use of consistent social interaction, multi-cultural programming and programming geared largely towards scholarship, career and community assistance, MLSA fosters academic achievement, understanding of and respect for differences, and, ultimately, the development of future minority leadership. The Mock Trial Board represents Fowler School of Law at various mock trial competitions around the United States. Teams of three or four members prepare and argue a case in an actual courtroom, with members of the bench and bar serving as judges. This includes making opening statements and closing arguments, conducting direct and cross-examination of witnesses and raising evidentiary objections when appropriate. The cases argued are carefully drafted legal problems that give members an opportunity to develop and enhance their trial advocacy skills in a courtroom setting. Outlaw is an educational, professional, political and social collaborative of law students, faculty and staff interested in working with Fowler School of Law and the surrounding community towards fostering and maintaining an environment that is supportive, positive and safe for individuals of sexual and gender diversity. While a vital function of Outlaw is to stimulate and assist students in their professional careers, the organization also serves as a forum in which Fowler School of Law students, staff and faculty may coordinate their efforts to combat homophobia, transphobia, heterosexism, discrimination and prejudice. Outlaw will work to promote the interests of gay, lesbian and transgender students, faculty and staff members and allies at Fowler School of Law. The total initiated membership of PDP exceeds 200,000 persons. More judges, American presidents, governors, senators, representatives, cabinet members, ambassadors, ABA presidents and law school deans have come from the ranks of Phi Delta Phi than any other legal fraternity, including: James A. Baker, Hugo Black, Benjamin Cardozo, Henry Jackson, Robert F. Kennedy, Thurgood Marshall, Karl Llewellyn, William McKinley, Walter Mondale, Sandra Day O'Connor, William Prosser, William Rehnquist, Franklin D. Roosevelt, Theodore Roosevelt, Antonin Scalia, Byron White, William Taft, Earl Warren and our own former Dean Parham Williams! All Fowler School of Law students who have successfully completed at least one semester of law school and are in good academic standing are eligible for application to the Mosk Inn. First year students are eligible to participate in all public Inn activities and can be initiated following the posting of first semester grades. Chapman University Dale E. Fowler School of Law’s Public Interest Law Foundation (PILF) is an organization dedicated to creating new and innovative opportunities for law students to engage in critically needed public interest work. PILF supports and promotes public interest work by funding law students who dedicate their time to serving our community. We support Fowler Law students through summer grants so they can serve in unpaid/volunteer positions in the public interest field. Including non-profit and organizations governmental positions, such as the District Attorney's Office, Public Defender's Office or the City Attorney's Office. PILF believes that everyone should have access to competent legal counsel regardless of economic status. PILF works to innovatively promote and support public interest legal work by educating, encouraging, and providing financial support for law students to consider and explore careers and pro bono opportunities in public interest law during law school and beyond. PILF provides students with volunteer opportunities throughout the year to give back and get involved in the community. PILF has a yearly gala put on by the law students to help raise funds for student scholarships. If you would like more information about PILF, or would like to get involved, please feel free to contact PILF via email. This Commitment to Service Award is available to all students completing 50 hours of public service work. Learn More about the Commitment to Service Award Program. The Student Bar Association is a multi-functional organization. First the SBA Board serves as a liaison between the student body and administration and faculty. To facilitate this communication and to address student-specific needs, board members serve on several committees. The SBA is also responsible for funding student activities and organizations. Finally, the SBA Board provides social opportunities for students at several school-wide functions annually. Students of Law Against Trafficking and Exploitation (SLATE) is a student organization formed to help address various concerns arising from the increasingly high rates of domestic human trafficking in Orange County. SLATE will address these issues by taking a victim-centered approach to create awareness, facilitate meaningful dialogue about human trafficking laws and create new partnerships to increase victim resources and the prosecution of pimps and human traffickers. The purpose of the society is to promote and encourage the study of taxation law and to develop a strong relationship with the business and legal community. The Tax Law Society organizes many events throughout the year. At these events, the members of the society have the opportunity to network with the business and legal communities of Southern California. Meet the Firms Night. The Annual Meet the Firms Night is a chance for students to meet and network with tax law professionals from throughout Southern California. Organized in conjunction with the Career Services Office, Meet the Firms night brings numerous tax law employers to Chapman in an effort to further foster relationships with the local tax law and business community. Speaker Series. The Tax Law Society also brings distinguished guest speakers to Chapman. The speaker series allows students to learn about opportunities and careers from guest speakers who are tax professionals from various areas of practice. The speaker series has also brought renowned tax specialists to Chapman to discuss such topics as the Taxpayer Relief Act of 1997, the 1998 IRS Restricting and Reform Act and Federal Tax Policy in the New Millennium. Past events have also included bowling, baseball games and dining. 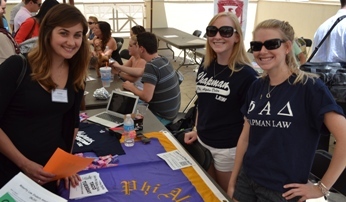 Learn more about the competition teams at Chapman.